↑ ୧.୦ ୧.୧ Koepfli KP, Deere KA, Slater GJ, et al. (2008). "Multigene phylogeny of the Mustelidae: Resolving relationships, tempo and biogeographic history of a mammalian adaptive radiation". BMC Biol. 6: 4–5. doi:10.1186/1741-7007-6-10. PMC 2276185. PMID 18275614. ↑ Geraads, Denis; Alemseged, Zeresenay; Bobe, René; Reed, Denné (2011). "Enhydriodon dikikae, sp. nov. (Carnivora: Mammalia), a gigantic otter from the Pliocene of Dikika, Lower Awash, Ethiopia". Journal of Vertebrate Paleontology. 31 (2): 447–453. doi:10.1080/02724634.2011.550356. ↑ "Otter". Merriam Webster's online dictionary. Retrieved 16 September 2009. ↑ Kruuk H (2007). Otters: ecology, behaviour and conservation. Oxford Biology. p. 7. ISBN 978-0-19-856587-1. ↑ "Facts about otters". Otter World. Retrieved 1 January 2016. ↑ Pagett, Matt (2007). What Shat That? : A Pocket Guide to Poop Identity. ISBN 978-1-58008-885-5. ↑ "Spraint Analysis". archive.today. Archived from the original on 8 September 2012. Retrieved 28 September 2017. ↑ Kruuk H (2007). 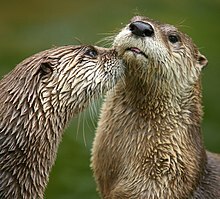 Otters: ecology, behavior and conservation. Oxford Biology. pp. 99–116. ISBN 978-0-19-856587-1. ↑ "Tool use in otters". OneKind. Archived from the original on 4 November 2016. Retrieved 1 January 2016. ↑ Bininda-Emonds OR, Gittleman JL, Purvis A (1999). "Building large trees by combining phylogenetic information: a complete phylogeny of the extant Carnivora (Mammalia)" (PDF). Biol Rev Camb Philos Soc. 74 (2): 143–75. CiteSeerX 10.1.1.328.7194. doi:10.1017/S0006323199005307. PMID 10396181. ↑ "Otters – Physical Characteristics". seaworld.org. Archived from the original on 2 November 2007. Retrieved 17 November 2009. ↑ ୧୬.୦ ୧୬.୧ "Sea Otter – Enhydra lutris – facts, video, and sound". Defenders of Wildlife. Retrieved 17 November 2009. ↑ Laidre, Kristin; Jameson, Donald; DeMaster, Douglas (2001). "Carrying Capacity of Otters" (PDF). 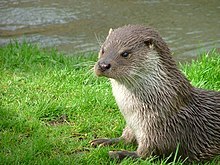 otterproject.org. Marine Mammal Science. Retrieved 4 November 2016. ↑ "Otter hunting". Otter-World.com. 2009. Retrieved 19 September 2013. ↑ "Otter Hunting AKA Otter Hunting Begins – British Pathé". britishpathe.com. Retrieved 28 September 2017. ↑ "Otterhunting". Animal Cruelty Investigation Group/Animal Welfare Information Service. Retrieved 19 September 2013. ↑ "Otters feel the heat in Southeast Asia". Traffic (conservation programme). 9 December 2009. Retrieved 17 January 2014. ↑ de Trey-White, Simon (2007). "Fisherman's friend". Geographical. 79 (5). ↑ "Swamp Tigers from Sundarbans". ↑ "The Otter's Ransom". faculty.mcla.edu. Archived from the original on 9 September 2006. Retrieved 5 July 2007. ↑ "Native American Indian Otter Legends, Meaning and Symbolism from the Myths of Many Tribes". www.native-languages.org. ↑ Cooper, JC (1992). Symbolic and Mythological Animals. London: Aquarian Press. pp. 171–72. ISBN 978-1-85538-118-6. ↑ 柳田國男 (1977) . 妖怪談義. 講談社学術文庫. 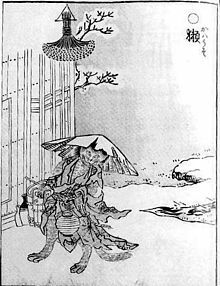 講談社. p. 19. ISBN 978-4-06-158135-7. ↑ ୨୯.୦ ୨୯.୧ 村上健司編著 (2000). 妖怪事典. 毎日新聞社. p. 114. ISBN 978-4-620-31428-0. ↑ 水木しげる (1994). 妖怪大図鑑. 講談社まんが百科. 講談社. p. 59. ISBN 978-4-06-259008-2. ↑ ୩୧.୦ ୩୧.୧ 柴田宵曲 (1991) . "続妖異博物館". In 木村新他編. 柴田宵曲文集. 6. 小沢書店. p. 477. ↑ 藤井昭編著 (1976). 安芸の伝説. 第一法規出版. p. 166. ↑ 内田邦彦 (1979) . 津軽口碑集. 歴史図書社. p. 126.